Store Brands | January 31, 2018 – The simple truth is it will be etched as “extraordinary” in the private brand history books. I’m talking about the Kroger Co.’s Simple Truth and Simple Truth Organic private brands, released in September 2012. Last week Kroger announced the lines had achieved a whopping $2 billion in sales. That’s $2 billion in sales for a store brand in about five years. Simple Truth and Simple Truth Organic products are free from 101 artificial preservatives and ingredients. Simple Truth Organic products are certified organic by the USDA. Kroger didn’t just roll out the lines to jump on the free-from ingredient and organic bandwagon in 2012. Listening to its customers, Kroger addressed concerns about free-from and organic products, beginning with price. In 2012, Simple Truth and Simple Truth Organic consisted of about 250 products. That has ballooned to more than 1,400 products across multiple categories, including grocery, meat, produce, deli, bakery, baby, household essentials, personal care and Fair Trade Certified. “Here’s Simple Truth in a nutshell: natural and organic foods that are affordable,” Gil Phipps, Kroger’s vice president of corporate brands, told me recently when I met with him at Kroger’s headquarters in Cincinnati. The success of Simple Truth and Simple Truth Organic is not lost upon Carl Jorgensen, director of global thought leadership/wellness for Stamford, Conn.-based Daymon, which provides retail strategies and services to help retailers grow their private brands. Jorgensen calls Simple Truth the most successful private brand launch in the history of the grocery industry. “The success of Simple Truth and Kroger’s other private brand programs is a testament to the fact that Kroger is thinking in a new way about private brands and treating them as actual brands,” Jorgensen says. 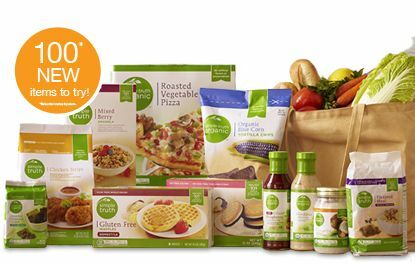 When Kroger introduced Simple Truth and Simple Truth Organic, it did so behind an integrated marketing campaign involving both in-store and online components. In-store communications include branded shelf signs, stanchions in produce and meat sections, and front-of store standees and banners in more than 2,200 Kroger and banner brand stores. Online elements included a Simple Truth website (www.simpletruth.com) and a social media presence on Facebook, Twitter and Pinterest. As Jorgensen says, Kroger went all out to promote its new brand, something that was also different for a private brand. “[Kroger] got behind the brand, which was the opposite of the old practice of launching and leaving it in private brands,” Jorgensen says. Something tells me that sales of Simple Truth and Simple Truth Organics will not stop at $2 billion.